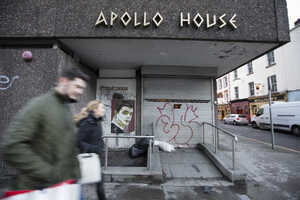 The High Court has refused to grant an extension for a stay on its order to vacate Apollo House in Dublin. 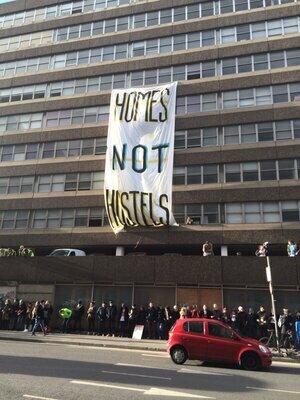 The judge said the provision of suitable alternative accommodation was a matter for Government not the courts. The case returns to court tomorrow to see if the order has been complied with. 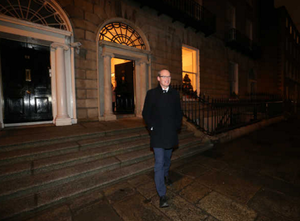 …Mr Justice Paul Gilligan said it was not the function of the courts to become involved in the provision of suitable accommodation for homeless people. 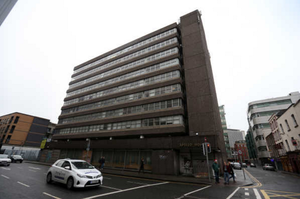 He said the occupants of Apollo House were entitled to take legal proceedings under the Constitution or the European Convention on Human Rights. He said the issue before the court involves the right to ownership of private property. 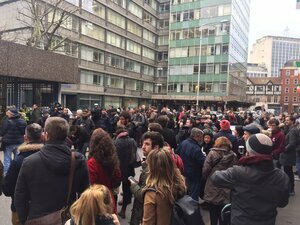 Supporters of the Home Sweet Home campaign have linked arms and surrounded the Apollo House building. Rosi Leonard, of Home Sweet Home, responds to Mr Justice Paul Gilligan’s decision. Posted in Misc and tagged Apollo House, Extension denied at 12:24 pm on January 11, 2017 by Broadsheet. Judge says the case is about trespass, not quality of accommodation. And he’d be right too. So one had a word in his ear over the Xmas mulled wine in the law library? I’m not sure I follow? He’s applying the law as it is set out. And I’m not sure what the “So one…” is referring to? Do you mean to imply that someone who works in the legal profession would refer to themselves in the 3rd person all the time? What conspiracy theory would that be? The law is cold, clinical and emotionless. The judge should not have been put in this position in the first place. I was walking by there earlier – Homeless people sure like bongo drums a LOT. That may be why they are homeless in the first place – annoy your neighbours enough and you will be out on your ear too. The viciousness of a establishment under pressure will soon make itself known…. 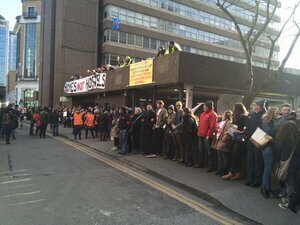 Eventually the Guards will be sent by Garda Management to force eviction and will be the bad guys again. Brace yourself for suspiciously edited videos of police brutality while the politicians will sit sipping their beers in Leinster House waving a report around as if people can live in it. This. I feel sorry for the Gardaí. They really will end up abused for upholding the law. The problem isn’t with them. Had a laugh at rent-a-gay Kieran there. Presumably when people were being charged for homosexual behaviour he was cheerleading the authorities upholding the “law of the land” there too? Haha what? What a leap. If someone breaks into your house, I’ll be hoping the authorities uphold the law of the land there too. So are you saying you oppose state sanctioned violence against gays Kieran? It’s hard to keep track of your position on anything seeing as you are such a slimy little rat. Of course I oppose state sanctioned action against gays. What the hell are you talking about? How bizarre of you to conflate the two. But by all means keep the personal insults coming. I’d say it’s pretty bizarre to launch tirades against the poor demanding the law of the land be upheld while selectively deferential to it except when it affects your own just cause. I +1’d a comment that the case was about trespass, not accommodation. You’re seeing things. You might need to lie down. What is this rubbish? Are you able to make a point without resorting to name calling and needless personal attacks just because they have a slightly different opinion to yours. Grow up. Use the 160K to rent reasonably priced private accommodation outside of the city centre, and allow people to retrain, reeducate and get jobs? or maybe use it to relocate people outside of dublin so they can get a fresh start? 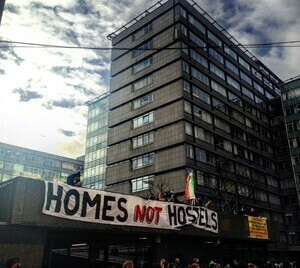 How is illegally occupying a building really going to help people in the long run. This huge circle jerk has really become boring, and now they’re starting with this “shame on you Sh** ” and attacking a judge for simply upholding the law..
Mmm. There are two rights in question: the right to own private property, and the right to be safely housed. Which one Irish people choose to give priority says a lot about Ireland. The “Irish people” don’t get a say in the decisions of the courts unless represented by a jury. 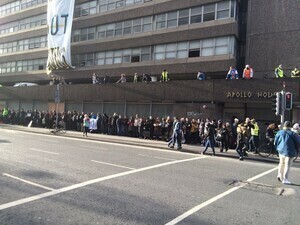 The “Irish people” may well prefer to see Apollo House used to house the homeless until the government is forced to sort out proper accommodation but the judge has to decide based on the legality of the case and not the will of the people. Well done to Home Sweet Home and all of the volunteers and supporters who brought the demand for decent shelter and accommodation to the fore and secured real improvements in provision for the homeless. Courageous campaigning is the only thing that will force this ‘property owners state’ to put human rights before their ‘sacred’ right to hoard and extract wealth through house-bankopoly. Meanwhile Minister Noonan betrays generations of young people, tenants and home-buyers for the benefit of delinquent Irish bankers and vulture funds.